For other uses, see DVD (disambiguation). Up to four layers are possible in a standard form DVD. DVD (an abbreviation of digital versatile disc) is a digital optical disc storage format invented and developed in 1995. The medium can store any kind of digital data and is widely used for software and other computer files as well as video programs watched using DVD players. DVDs offer higher storage capacity than compact discs while having the same dimensions. Prerecorded DVDs are mass-produced using molding machines that physically stamp data onto the DVD. Such discs are a form of DVD-ROM because data can only be read and not written or erased. Blank recordable DVD discs (DVD-R and DVD+R) can be recorded once using a DVD recorder and then function as a DVD-ROM. Rewritable DVDs (DVD-RW, DVD+RW, and DVD-RAM) can be recorded and erased many times. DVDs are used in DVD-Video consumer digital video format and in DVD-Audio consumer digital audio format as well as for authoring DVD discs written in a special AVCHD format to hold high definition material (often in conjunction with AVCHD format camcorders). DVDs containing other types of information may be referred to as DVD data discs. The Oxford English Dictionary comments that, "In 1995 rival manufacturers of the product initially named digital video disc agreed that, in order to emphasize the flexibility of the format for multimedia applications, the preferred abbreviation DVD would be understood to denote digital versatile disc." The OED also states that in 1995, "The companies said the official name of the format will simply be DVD. Toshiba had been using the name ‘digital video disc’, but that was switched to ‘digital versatile disc’ after computer companies complained that it left out their applications." "Digital versatile disc" is the explanation provided in a DVD Forum Primer from 2000 and in the DVD Forum's mission statement. Comparison of several forms of disk storage showing tracks (tracks not to scale); green denotes start and red denotes end. * Some CD-R(W) and DVD-R(W)/DVD+R(W) recorders operate in ZCLV, CAA or CAV modes, but most work in constant linear velocity (CLV) mode. There were several formats developed for recording video on optical discs before the DVD. Optical recording technology was invented by David Paul Gregg and James Russell in 1958 and first patented in 1961. A consumer optical disc data format known as LaserDisc was developed in the United States, and first came to market in Atlanta, Georgia in 1978. It used much larger discs than the later formats. Due to the high cost of players and discs, consumer adoption of LaserDisc was very low in both North America and Europe, and was not widely used anywhere outside Japan and the more affluent areas of Southeast Asia, such as Hong-Kong, Singapore, Malaysia and Taiwan. CD Video released in 1987 used analog video encoding on optical discs matching the established standard 120 mm (4.7 in) size of audio CDs. Video CD (VCD) became one of the first formats for distributing digitally encoded films in this format, in 1993. In the same year, two new optical disc storage formats were being developed. One was the Multimedia Compact Disc (MMCD), backed by Philips and Sony, and the other was the Super Density (SD) disc, supported by Toshiba, Time Warner, Matsushita Electric, Hitachi, Mitsubishi Electric, Pioneer, Thomson, and JVC. By the time of the press launches for both formats in January 1995, the MMCD nomenclature had been dropped, and Philips and Sony were referring to their format as Digital Video Disc (DVD). Representatives from the SD camp asked IBM for advice on the file system to use for their disc, and sought support for their format for storing computer data. Alan E. Bell, a researcher from IBM's Almaden Research Center, got that request, and also learned of the MMCD development project. Wary of being caught in a repeat of the costly videotape format war between VHS and Betamax in the 1980s, he convened a group of computer industry experts, including representatives from Apple, Microsoft, Sun Microsystems, Dell, and many others. This group was referred to as the Technical Working Group, or TWG. On August 14, 1995, an ad hoc group formed from five computer companies (IBM, Apple, Compaq, Hewlett-Packard, and Microsoft) issued a press release stating that they would only accept a single format. The TWG voted to boycott both formats unless the two camps agreed on a single, converged standard. They recruited Lou Gerstner, president of IBM, to pressure the executives of the warring factions. In one significant compromise, the MMCD and SD groups agreed to adopt proposal SD 9, which specified that both layers of the dual-layered disc be read from the same side—instead of proposal SD 10, which would have created a two-sided disc that users would have to turn over. As a result, the DVD specification provided a storage capacity of 4.7 GB for a single-layered, single-sided disc and 8.5 GB for a dual-layered, single-sided disc. The DVD specification ended up similar to Toshiba and Matsushita's Super Density Disc, except for the dual-layer option (MMCD was single-sided and optionally dual-layer, whereas SD was two half-thickness, single-layer discs which were pressed separately and then glued together to form a double-sided disc) and EFMPlus modulation designed by Kees Schouhamer Immink. Philips and Sony decided that it was in their best interests to end the format war, and agreed to unify with companies backing the Super Density Disc to release a single format, with technologies from both. After other compromises between MMCD and SD, the computer companies through TWG won the day, and a single format was agreed upon. The TWG also collaborated with the Optical Storage Technology Association (OSTA) on the use of their implementation of the ISO-13346 file system (known as Universal Disk Format) for use on the new DVDs. Movie and home entertainment distributors adopted the DVD format to replace the ubiquitous VHS tape as the primary consumer digital video distribution format. They embraced DVD as it produced higher quality video and sound, provided superior data lifespan, and could be interactive. Interactivity on LaserDiscs had proven desirable to consumers, especially collectors. When LaserDisc prices dropped from approximately $100 per disc to $20 per disc at retail, this luxury feature became available for mass consumption. Simultaneously, the movie studios decided to change their home entertainment release model from a rental model to a for purchase model, and large numbers of DVDs were sold. At the same time, a demand for interactive design talent and services was created. Movies in the past had uniquely designed title sequences. Suddenly every movie being released required information architecture and interactive design components that matched the film's tone and were at the quality level that Hollywood demanded for its product. DVD as a format had two qualities at the time that were not available in any other interactive medium: enough capacity and speed to provide high quality, full motion video and sound, and low cost delivery mechanism provided by consumer products retailers. Retailers would quickly move to sell their players for under $200, and eventually for under $50 at retail. In addition, the medium itself was small enough and light enough to mail using general first class postage. Almost overnight, this created a new business opportunity and model for business innovators to re-invent the home entertainment distribution model. It also gave companies an inexpensive way to provide business and product information on full motion video through direct mail. Immediately following the formal adoption of a unified standard for DVD, two of the four leading video game console companies (Sega and The 3DO Company) said they already had plans to design a gaming console with DVDs as the source medium. (Sony, despite being one of the developers of the DVD format and eventually the first company to actually release a DVD-based console, stated at the time that they had no plans to use DVD in their gaming systems.) Game consoles such as the PlayStation 2, Xbox, and Xbox 360 use DVDs as their source medium for games and other software. Contemporary games for Windows were also distributed on DVD. The DVD specifications created and updated by the DVD Forum are published as so-called DVD Books (e.g. DVD-ROM Book, DVD-Audio Book, DVD-Video Book, DVD-R Book, DVD-RW Book, DVD-RAM Book, DVD-AR Book, DVD-VR Book, etc.). Some specifications for mechanical, physical and optical characteristics of DVD optical discs can be downloaded as freely available standards from the ISO website. There are also equivalent European Computer Manufacturers Association (Ecma) standards for some of these specifications, such as Ecma-267 for DVD-ROMs. Also, the DVD+RW Alliance publishes competing recordable DVD specifications such as DVD+R, DVD+R DL, DVD+RW or DVD+RW DL. These DVD formats are also ISO standards. Some DVD specifications (e.g. for DVD-Video) are not publicly available and can be obtained only from the DVD Format/Logo Licensing Corporation for a fee of US$5000. Every subscriber must sign a non-disclosure agreement as certain information in the DVD Book is proprietary and confidential. Like other optical disc formats before it, a basic DVD disc—known as DVD-5 in the DVD Books, while called Type A in the ISO standard—contains a single data layer readable from only one side. However, the DVD format also includes specifications for three types of discs with additional recorded layers, expanding disc data capacity beyond the 4.7GB of DVD-5 while maintaining the same physical disc size. Borrowing from the LaserDisc format, the DVD standard includes DVD-10 discs (Type B in ISO) with two recorded data layers such that only one layer is accessible from either side of the disc. This doubles the total nominal capacity of a DVD-10 disc to 9.4GB, but each side is locked to 4.7GB. Like DVD-5 discs, DVD-10 discs are defined as single-layer (SL) discs. 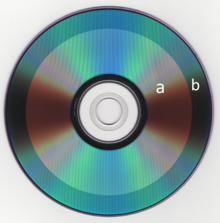 Double-sided discs identify the sides as A and B. The disc structure lacks the dummy layer where identifying labels are printed on single-sided discs, so information such as title and side are printed on one or both sides of the non-data clamping zone at the center of the disc. DVD-10 discs fell out of favor because, unlike dual-layer discs, they require users to manually flip them to access the complete content (a relatively egregious scenario for DVD movies) while offering only a negligible benefit in capacity. Additionally, without a non-data side, they proved harder to handle and store. Dual-layer discs also employ a second recorded layer, however both are readable from the same side (and unreadable from the other). These DVD-9 discs (Type C in ISO) nearly double the capacity of DVD-9 discs to a nominal 8.5GB, but fall below the overall capacity of DVD-10 discs due to differences in the physical data structure of the additional recorded layer. However, the advantage of not needing to flip the disc to access the complete recorded data—permiting a nearly contiguous experience for A/V content whose size exceeds the capacity of a single layer—proved a more favorable option for mass-produced DVD movies. DVD hardware accesses the additional layer (layer 1) by refocusing the laser through an otherwise normally-placed, semitransparent first layer (layer 0). This laser refocus—and the subsequent time needed to reacquire laser tracking—can cause a noticeable pause in A/V playback, the length of which varies between hardware. Studios began printing a standard message on keep cases explaining that this pause is not an indication of a damaged or defective disc. Dual-layer DVDs are recorded using Opposite Track Path (OTP). Most dual-layer discs are mastered with layer 0 starting at the inside diameter and proceeding outward—as is the case for most optical media, regardless of layer count—while Layer 1 starts at the absolute outside diameter and proceeds inward. Additionally, data tracks are spiraled such that the disc rotates the same direction to read both layers. 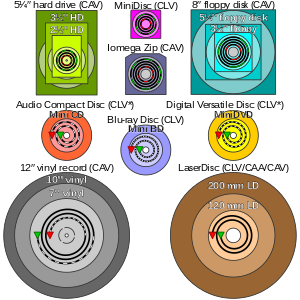 DVD video DL discs can be mastered slightly differently: a single media stream can be divided between the layers such that layer 1 starts at the same diameter that layer 0 finishes. This modification reduces the visible layer transition pause because after refocusing, the laser remains in place rather than losing additional time traversing the remaining disc diameter. DVD-9 was the first commercially-successful implementation of such technology. DVD-18 discs (Type D in ISO) effectively combines the DVD-9 and DVD-10 disc types by containing four recorded data layers (allocated as two sets of layers 0 and 1) such that only one layer set is accessible from either side of the disc. These discs provide a total nominal capacity of 17.0GB, with 8.5GB per side. The DVD Book also permits an additional disc type called DVD-14: a hybrid double-sided disc with one dual-layer side, one single-layer side, and a total nominal capacity of 12.3GB. DVD-14 has no counterpart in ISO. Both of these additional disc types are extremely rare due to their complicated and expensive manufacturing. Note: The above sections regarding disc types pertain to 12cm discs. The same disc types exist for 8cm discs: ISO standards still regard these discs as Types A–D, while the DVD Book assigns them distinct disc types. DVD-14 has no analogous 8cm type. The comparative data for 8cm discs is provided further down. HP initially developed recordable DVD media from the need to store data for backup and transport. DVD recordables are now also used for consumer audio and video recording. Three formats were developed: DVD-R/RW, DVD+R/RW (plus), and DVD-RAM. 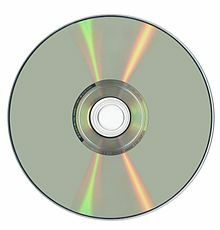 DVD-R is available in two formats, General (650 nm) and Authoring (635 nm), where Authoring discs may be recorded with CSS encrypted video content but General discs may not. Although most current DVD writers can write in both the DVD+R/RW and DVD-R/RW formats (usually denoted by "DVD±RW" or the existence of both the DVD Forum logo and the DVD+RW Alliance logo), the "plus" and the "dash" formats use different writing specifications. Most DVD hardware plays both kinds of discs, though older models can have trouble with the "plus" variants. Some early DVD players would cause damage to DVD±R/RW/DL when attempting to read them. The form of the spiral groove that makes up the structure of a recordable DVD encodes unalterable identification data known as Media Identification Code (MID). The MID contains data such as the manufacturer and model, byte capacity, allowed data rates (also known as speed), etc..
Dual-layer recording (occasionally called double-layer recording) allows DVD-R and DVD+R discs to store nearly double the data of a single-layer disc—8.5 and 4.7 gigabyte capacities, respectively. The additional capacity comes at a cost: DVD±DLs have slower write speeds as compared to DVD±R. DVD-R DL was developed for the DVD Forum by Pioneer Corporation; DVD+R DL was developed for the DVD+RW Alliance by Mitsubishi Kagaku Media (MKM) and Philips. Recordable DVD discs supporting dual-layer technology are backward-compatible with some hardware developed before the recordable medium. Many current DVD recorders support dual-layer technology, and while the costs became comparable to single-layer burners over time, blank dual-layer media has remained more expensive than single-layer media. The basic types of DVD (12 cm diameter, single-sided or homogeneous double-sided) are referred to by a rough approximation of their capacity in gigabytes. In draft versions of the specification, DVD-5 indeed held five gigabytes, but some parameters were changed later on as explained above, so the capacity decreased. Other formats, those with 8 cm diameter and hybrid variants, acquired similar numeric names with even larger deviation. 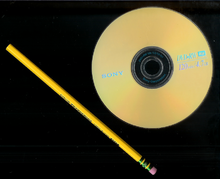 Scan of a DVD-R; the "a" portion has been recorded on while the "b" portion has not. All sizes are expressed in their decimal sense (i.e. 1 Gigabyte = 1,000,000,000 bytes etc.). DVD drives are devices that can read DVD discs on a computer. DVD players are a particular type of devices that do not require a computer to work, and can read DVD-Video and DVD-Audio discs. All three common optical disc media (Compact disc, DVD, and Blu-ray) use light from laser diodes, for its spectral purity and ability to be focused precisely. 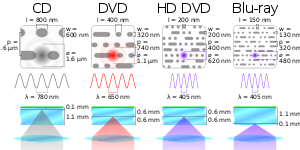 DVD uses light of 650 nm wavelength (red), as opposed to 780 nm (far-red, commonly called infrared) for CD. This shorter wavelength allows a smaller pit on the media surface compared to CDs (0.74 µm for DVD versus 1.6 µm for CD), accounting in part for DVD's increased storage capacity. In comparison, Blu-ray Disc, the successor to the DVD format, uses a wavelength of 405 nm (violet), and one dual-layer disc has a 50 GB storage capacity. Read and write speeds for the first DVD drives and players were 1,385 kB/s (1,353 KiB/s); this speed is usually called "1×". More recent models, at 18× or 20×, have 18 or 20 times that speed. Note that for CD drives, 1× means 153.6 kB/s (150 KiB/s), about one-ninth as swift. DVD-Video is a standard for distributing video/audio content on DVD media. The format went on sale in Japan in 1995, in the United States, Canada, Central America, and Indonesia in 1997, and in Europe, Asia, Australia, and Africa in 1998. DVD-Video became the dominant form of home video distribution in Japan when it first went on sale in 1995, but it shared the market for home video distribution in the United States until June 15, 2003, when weekly DVD-Video in the United States rentals began outnumbering weekly VHS cassette rentals. DVD-Video is still the dominant form of home video distribution worldwide except for in Japan where it was surpassed by Blu-ray Disc when Blu-ray first went on sale in Japan on March 31, 2006. The Content Scramble System (CSS) is a digital rights management (DRM) and encryption system employed on almost all commercially produced DVD-video discs. CSS utilizes a proprietary 40-bit stream cipher algorithm. The system was introduced around 1996 and was first compromised in 1999. CSS prevents byte-for-byte copies of an MPEG (digital video) stream from being playable since such copies do not include the keys that are hidden on the lead-in area of the restricted DVD. CSS provides a reason for manufacturers to make their devices compliant with an industry-controlled standard, since CSS scrambled discs cannot in principle be played on noncompliant devices; anyone wishing to build compliant devices must obtain a license, which contains the requirement that the rest of the DRM system (region codes, Macrovision, and user operation prohibition) be implemented. While most CSS-decrypting software is used to play DVD videos, other pieces of software (such as DVD Decrypter, AnyDVD, DVD43, Smartripper, and DVD Shrink) can copy a DVD to a hard drive and remove Macrovision, CSS encryption, region codes and user operation prohibition. The rise of filesharing has prompted many copyright holders to display notices on DVD packaging or displayed on screen when the content is played that warn consumers of the illegality of certain uses of the DVD. It is commonplace to include a 90-second advertisement warning that most forms of copying the contents are illegal. Many DVDs prevent skipping past or fast-forwarding through this warning. Arrangements for renting and lending differ by geography. In the U.S., the right to re-sell, rent, or lend out bought DVDs is protected by the first-sale doctrine under the Copyright Act of 1976. In Europe, rental and lending rights are more limited, under a 1992 European Directive that gives copyright holders broader powers to restrict the commercial renting and public lending of DVD copies of their work. DVD-Audio is a format for delivering high fidelity audio content on a DVD. It offers many channel configuration options (from mono to 5.1 surround sound) at various sampling frequencies (up to 24-bits/192 kHz versus CDDA's 16-bits/44.1 kHz). Compared with the CD format, the much higher-capacity DVD format enables the inclusion of considerably more music (with respect to total running time and quantity of songs) or far higher audio quality (reflected by higher sampling rates, greater sample resolution and additional channels for spatial sound reproduction). DVD-Audio briefly formed a niche market, probably due to the very sort of format war with rival standard SACD that DVD-Video avoided. DVD-Audio discs employ a DRM mechanism, called Content Protection for Prerecorded Media (CPPM), developed by the 4C group (IBM, Intel, Matsushita, and Toshiba). Although CPPM was supposed to be much harder to crack than a DVD-Video CSS, it too was eventually cracked, in 2007, with the release of the dvdcpxm tool. The subsequent release of the libdvdcpxm library (based on dvdcpxm) allowed for the development of open source DVD-Audio players and ripping software. As a result, making 1:1 copies of DVD-Audio discs is now possible with relative ease, much like DVD-Video discs. In 2006, two new formats called HD DVD and Blu-ray Disc were released as the successor to DVD. HD DVD competed unsuccessfully with Blu-ray Disc in the format war of 2006–2008. A dual layer HD DVD can store up to 30 GB and a dual layer Blu-ray disc can hold up to 50 GB. However, unlike previous format changes, e.g., vinyl to Compact Disc or VHS videotape to DVD, there is no immediate indication that production of the standard DVD will gradually wind down, as they still dominate, with around 75% of video sales and approximately one billion DVD player sales worldwide as of 3 April 2011[update]. In fact, experts claim that the DVD will remain the dominant medium for at least another five years as Blu-ray technology is still in its introductory phase, write and read speeds being poor and necessary hardware being expensive and not readily available. Consumers initially were also slow to adopt Blu-ray due to the cost. By 2009, 85% of stores were selling Blu-ray Discs. A high-definition television and appropriate connection cables are also required to take advantage of Blu-ray disc. Some analysts suggest that the biggest obstacle to replacing DVD is due to its installed base; a large majority of consumers are satisfied with DVDs. The DVD succeeded because it offered a compelling alternative to VHS. In addition, the uniform media size let manufacturers make Blu-ray players and now defunct format HD DVD players backward-compatible, so they can play older DVDs. This stands in contrast to the change from vinyl to CD, and from tape to DVD, which involved a complete change in physical medium. As of 2018[update] it is still commonplace for studios to issue major releases in "combo pack" format, including both a DVD and a Blu-ray disc (as well as a digital copy). Also, some multi-disc sets use Blu-ray for the main feature, but DVDs for supplementary features (examples of this include the Harry Potter "Ultimate Edition" collections, the 2009 re-release of the 1967 The Prisoner TV series, and a 2007 collection related to Blade Runner). Another reason cited (July 2011) for the slower transition to Blu-ray from DVD is the necessity of and confusion over "firmware updates" and needing an internet connection to perform updates. This situation is similar to the changeover from 78 rpm shellac recordings to 45 rpm and 33⅓ rpm vinyl recordings. Because the new and old media were virtually the same (a disc on a turntable, played by a needle), phonograph player manufacturers continued to include the ability to play 78s for decades after the format was discontinued. Manufacturers continue to release standard DVD titles as of 2019[update], and the format remains the preferred one for the release of older television programs and films. Shows that were shot and edited entirely on film, such as Star Trek: The Original Series, cannot be released in high definition without being re-scanned from the original film recordings. Certain special effects were also updated to appear better in high-definition. Shows that were made between the early '80s and the early 2000s were generally shot on film, then transferred to cassette tape, and then edited natively in either NTSC or PAL, making high-definition transfers literally impossible as these SD standards were baked into the final cuts of the episodes. Star Trek: The Next Generation is the only such show that has gotten a Blu-Ray release. The process of making high-definition versions of TNG episodes required finding the original film clips, re-scanning them into a computer at high definition, digitally re-editing the episodes from the ground up, and re-rendering new visual effects shots, an extraordinarily labor-intensive ordeal that cost Paramount over $12 million. The project was a financial failure and resulted in Paramount deciding very firmly against giving Deep Space Nine and Voyager the same treatment. DVDs are also facing competition from video on demand services. With increasing numbers of homes having high speed Internet connections, many people now have the option to either rent or buy video from an online service, and view it by streaming it directly from that service's servers, meaning that the customer need not have any form of permanent storage media for video at all. By 2017, digital streaming services had overtaken the sales of DVDs and Blu-rays for the first time. DVD longevity is measured by how long the data remains readable from the disc, assuming compatible devices exist that can read it: that is, how long the disc can be stored until data is lost. Numerous factors affect longevity: composition and quality of the media (recording and substrate layers), humidity and light storage conditions, the quality of the initial recording (which is sometimes a matter of mutual compatibility of media and recorder), etc. According to NIST, "[a] temperature of 64.4 °F (18 °C) and 40% RH [Relative Humidity] would be considered suitable for long-term storage. A lower temperature and RH is recommended for extended-term storage." According to the Optical Storage Technology Association (OSTA), "Manufacturers claim lifespans ranging from 30 to 100 years for DVD, DVD-R and DVD+R discs and up to 30 years for DVD-RW, DVD+RW and DVD-RAM." ^ a b "DVD FLLC - DVD Format Book". Dvdfllc.co.jp. Retrieved 28 October 2017. ^ a b "BOOKS OVERVIEW". Mpeg.org. Retrieved 28 October 2017. ^ Johnson, Lawrence B. (September 7, 1997). "For the DVD, Disney Magic May Be the Key". The New York Times. Retrieved 2009-05-25. ^ Oxford English Dictionary, DVD. ^ "DVD Primer". DVD Forum. September 6, 2000. Retrieved 2013-12-14. ^ "DVD Forum's Mission". DVD Forum. January 14, 2010. Retrieved 2014-06-11. ^ "WCES: The Calm Before the Storm". Next Generation. Imagine Media (3): 18. March 1995. ^ a b "DVD Plagued by Double Standards". Next Generation. Imagine Media (6): 16–17. June 1995. ^ "Electronic Giants Battle On". Next Generation. Imagine Media (11): 19. November 1995. ^ a b "DVD: coming soon to your PC?". Computer Shopper. 16 (3): 189. March 1, 1996. ^ Uhlig, Robert (22 November 2004). "DVD kills the video show as digital age takes over". Telegraph.co.uk. Retrieved 28 October 2017. ^ a b "DVD Game Consoles?". Next Generation. No. 18. Imagine Media. June 1996. p. 40. ^ "Standard ECMA-267". Ecma-international.org. Retrieved 28 October 2017. ^ "DVD players benchmark". hometheaterhifi.com. Archived from the original on March 13, 2008. Retrieved 2008-04-01. ^ "DVD Studio Pro 4 User Manual". documentation.apple.com. Retrieved 28 October 2017. ^ a b c "DVD-14". AfterDawn Ltd. Retrieved 2007-02-06. ^ Watson, James. "The recordable DVD clinic". The Register. Retrieved 15 October 2001. ^ "DVD Media / DVD-R Media". Tape Resources. Archived from the original on 2011-07-27. Retrieved 2011-08-09. ^ "DVDs" (PDF). PDST Technology in Education. Retrieved 2017-01-22. ^ a b DeMoulin, Robert. "Understanding Dual Layer DVD Recording". BurnWorld.com. Retrieved 2007-07-06. ^ "DVD Book A: Physical parameters". Mpeg.org. Retrieved 2009-08-22. ^ a b Taylor, Jim. "DVD Demystifed FAQ". Dvddemystified.com. Archived from the original on August 22, 2009. Retrieved 2009-08-22. ^ "Understanding DVD -Recording Speed". Osta.org. Retrieved 2011-08-09. ^ The write time is wildly optimistic for higher (>4x) write speeds, due to being calculated from the maximum drive write speed instead of the average drive write speed. ^ Bakalis, Anna (2003-06-20). "It's unreel: DVD rentals overtake videocassettes". Washington Times. ^ "What is Blu-ray Disc?". Sony. Retrieved 2008-11-25. ^ "DVD FAQ: 3.13 – What about the new HD formats?". 2008-09-21. Retrieved 2008-11-25. ^ "High-Definition Sales Far Behind Standard DVD's First Two Years". Movieweb.com. 2008-02-20. Archived from the original on 2008-09-14. Retrieved 2009-08-22. ^ "Blu-ray takes 25% Market share:". 2008-09-21. Retrieved 2011-06-28. ^ Martorana, Robert (2009-11-04). "Slow Blu-ray Adoption: A Threat to Hollywood's Bottom Line?". Seeking Alpha. Retrieved 2011-08-09. ^ "Gates And Ballmer On "Making The Transition"". BusinessWeek. 2004-04-19. Archived from the original on 2009-08-26. Retrieved 2009-08-22. ^ "Are DVDs becoming obsolete?". Electronics.howstuffworks.com. 1 November 2014. Retrieved 30 December 2016. ^ "Amazon.com: Customer Discussions: When will DVDs be obsolete?". Amazon.com. Retrieved 30 December 2016. ^ Romano, Nick. "Is the DVD Becoming Obsolete?". ScreenCrush. Retrieved 30 December 2016. ^ "DVD Going The Way Of VHS In 2016 - CINEMABLEND". Cinemablend.com. 6 June 2014. Retrieved 30 December 2016. ^ Sweney, Mark (5 January 2017). "Film and TV streaming and downloads overtake DVD sales for first time". Theguardian.com. Retrieved 28 October 2017. ^ Chang, Wo (2007-08-21). "NIST Digital Media Group: docs/disccare". National Institute of Standards and Technology. Retrieved 2013-12-18. ^ "Understanding DVD - Disc Longevity". Osta.org. Retrieved 28 October 2017. Bennett, Hugh (April 2004). "Understanding Recordable and Rewritable DVD". Optical Storage Technology Association. Retrieved 2006-12-17. Labarge, Ralph (2001). DVD Authoring and Production. Gilroy, California: CMP Books. ISBN 1-57820-082-2. Taylor, Jim (2000). DVD Demystified (2nd ed.). New York: McGraw-Hill Professional. ISBN 0-07-135026-8. YouTube "DVD Gallery": 1997 Toshiba DVD demo disc (segment) — an in-store Toshiba demonstration disc with technical information on the "then-new" DVD format.